We haven't seen any plausible iPhone 8 photo leaks just yet, but Apple's long-rumored curved design could end up looking like this brand new phone out of China. The Honor Magic is the latest Android smartphone from the Huawei brand, and its curved 5.09-inch screen helps it stand out even more than the shiny Honor 8. It's a real head-turner thanks to its noticeably curved AMOLED display on the right and left sides, reminiscent of the Samsung Galaxy S7 Edge. To literally top it off, the top of the Honor Magic also appears to bend inward. This is a a lot like the distinct 2.5D glass on the LG G5. There's a bit more to the Honor Magic than its 3D-glass good looks that are ripe for Apple's picking. We now have full specs and software details. 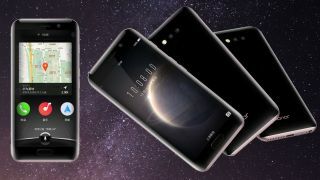 It has the familiar Hisilicon Kirin 950 chipset, boasting an octacore processor, 4GB of RAM and 64GB or internal storage, according to the Honor website. We found all of these identical specs to be speedy enough in our Honor 8 review, but what's dramatically different are the onboard sensors. Honor Magic will automatically unlock when you look at the screen (face detect, seen it), but it'll also turn off when you look away. Going one step further, its FaceCode detection will only display lockscreen notification details to pre-registered faces. No more potential awkwardness. Huawei promises more intelligent software features like this, and it also touts fast charging: 40% in just 10 minutes (great) and 70% in just 20 minutes (astounding) via its proprietary speed charging technology (meh). Honor Magic isn't coming to the US, UK and Australia, at least not yet. But we could see this smartphone design from the iPhone 8 for several reasons. Apple is said to be working on a curved iPhone for 2017, the 10th anniversary of its groundbreaking touchscreen handset. And it's ready for a fresh new look. What's more is that Apple has taken a liking to completely rounded off edges (see the iPhone 7 and iPhone 7 Plus) on its most recent smartphone designs, save for the boxy iPhone SE. The the top, left and right curves on the Honor Magic demonstrate that exact look. It doesn't hurt that Huawei's software looks like iOS 10.2 re-imagined and the name uses a version Apple's absolute favorite work: "magical." There's no Honor Magic release date just yet for the West, but we'll keep you updated if that changes and, of course, give you the latest Apple's iPhone 8 news at the same time.